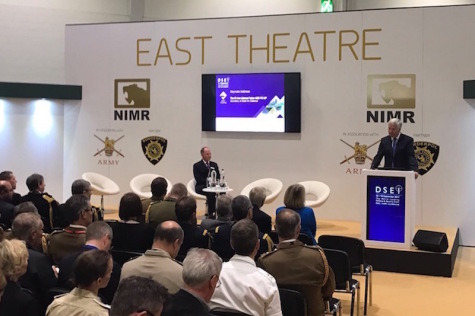 UK Defence Secretary Sir Michael Fallon delivers the keynote speech at the DSEI 2017 exhibition in London. Secretary of State for Defence Sir Michael Fallon delivered the keynote speech at the Defence and Security Equipment International 2017 at the Excel Centre in London. In the past year, you’ll have seen a flood of announcements, from sailing new carriers to naming Dreadnought submarines, from buying Apache attacks helicopters to testing Ajax armoured vehicles and from the arrival of more F35s, to last week’s announcement about future frigates. We’ve given 30 firms a share of £3 million pound to develop machine learning algorithms and artificial intelligence so it can crunch all the big data collected by our vehicles and translate it into a four-dimensional picture of the battle space. Robots will never replace humans. It takes a soldier to search a house, calm a villager, win hearts and minds in a war zone. Even more remarkable we’ve come up with a bit of kit that will appeal as much to the accountant as the warrior because, instead of spending hundreds of thousands on missiles, the energy in a high-intensity laser costs pennies. But don’t worry: Dragonfire will soon be tested on a British warship. Since the 2015 SDSR international threats have intensified. So, rather than resting on our laurels, we’re currently conducting a National Security Capability Review. Choice is key to addressing the threat we face. The second aspect of our approach is collaboration. Or consider F-35, an innovative partnership between BAE Systems and Northrop Grumman working alongside our Defence Electronics and Components Agency in Sealand. So successful in its bid that it wasn’t just chosen as the European repair hub for F-35 avionic and aircraft components, but as the global support provider, sustaining hundreds of jobs directly and thousands more high-value jobs across the supply chain. From the start, the F-35 programme itself has been not simply an exemplar of domestic collaboration, but of international collaboration, where we’re proud to be a Tier One partner with the US, and to build 15 per cent of each and every aircraft. And as Britain’s looks to go global, we see our equipment as a platform for stronger partnership. Consider P8 maritime patrol aircraft. A few months ago, we struck an agreement with our fellow P8 nations Norway and the US, to pursue closer co-operation on training, logistics, and support and address the changing security environment in the North Atlantic. International success brings me to the third element of our new approach to defence competition. I’m a big believer in competition. I know its power not just to strengthen our industry and bring in the wealth that benefits the UK, but to bring down prices as well-meaning we can afford to buy even more kit. And as we look to life post Brexit, and seek to spread our wings across the world, it’s high time we do more to compete for a share of this international export market. Above all we’ve set the price we want each frigate to cost. And the MOD, in particular, are pleased to now be supporting and leading some of those campaigns in Europe, the Middle East and South-East Asia, where we believe Typhoon meets the requirements of our international partners. It’s already in high demand with the Italian Army. So, we’ve got high hopes for UK companies. And what better place to bring the message home than DSEI, where the kit is the star of the show and where the globe’s investors gather in one place? So, two years down the line, Britain’s transforming its approach. And if you needed convincing that MOD really has changed its style look at the experts who make up our new innovation advisory panel. The former owner of a racing car company and an astronaut. The message is clear. The UK’s moving at pace.